I mentioned in yesterday's post that we had a Christmas party. I've been hosting something around Christmas for the last few years, and I love that it's become a bit of a tradition amongst friends now. It's just a great excuse to get everyone together, and if you can't do it at Christmas, when can you?! This year I was sent some gorgeous glasses from Root 7. 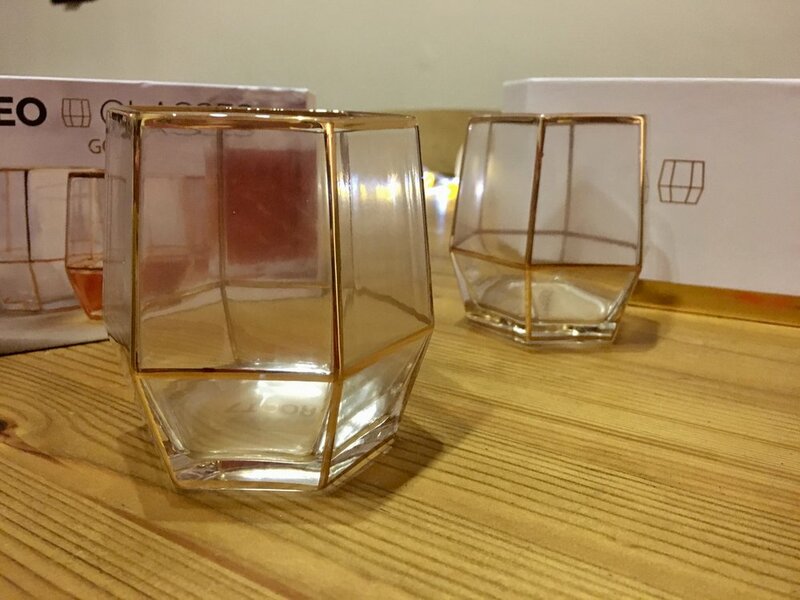 They'd caught my eye because of the angular design, and the gold edging just set it off really - you know I'm a bit of a magpie, so they're a great addition to the drinks cabinet. They're bigger than I had anticipated, so you can get a good measure in, plus they're stackable so great if you're tight on cupboard space. We had fun trying out cocktails in them, and gin, and...well, you get the picture. I was also quite excited to see them featured on This Morning - I must admit, it's a bit of a guilty pleasure of mine so when I saw the glasses on the telly I felt quite smug! Sad, I know. An alternative use for them would be as a little planter - how cute would a little cactus look? Or perhaps gather a few together and have a mini herb garden on your windowsill. For me, they're too pretty to do that, so I'll continue enjoying a drink. The Geo Glass from Root 7 come as a pair starting at £24 (although you can buy single glasses too). They're available from various retailers, including John Lewis, Ocado and Asos, and come in black as well as gold. Obviously I already have some, so this isn't a hint - but I reckon they'd make a lovely and very stylish wedding gift, don't you? This is an independent review of a product gifted to me by Root 7.